Creative coder, musician and Mathematician, she combines her artistic activity with teaching Mathematics, creative programming and research. As a Mathematician, she is a Professor at the Universitat Politècnica de Catalunya. Her recent research her research on the relationship between art, mathematics and techology, and works on the creative use of information and communication technologies, recently, and in the fields of graph theory, communication algorithms and combinatorial geometry, in the past years. She is interested in music and visual arts, which led her to apply her mathematical knowledge to the creative use of programming. Besides Mathematics, she also taught Creative programming and Music and Mathematics. She also has collaborated in the Master on Sound Art of the Fine Arts School at the Universitat de Barcelona. Active in the scene of free improvisation in Barcelona. Works with acustic and amplified objects, electronic devices, field recordings and programming, with a minimalistic approach. Her current projects are: solo project, A=B, with Ferran Fages, blaast, with Alfredo Costa Monteiro, and Un coup de dés, with Marta Sainz. She also collaborates, or has collaborated, with other improvisers as Olga Ábalos, Ruth Barberán, Tom Chant, Miguel Angel García, Tomás Gris, Xavier Lopez, Eduard Màrquez, Héctor Rey, Tom Soloveitzik, Nuno Rebelo, Josema Urós, Dafne Vicente-Sandoval, Artur Vidal. Festivals she participated in: Sónar (Barcelona, 2003), insolit music forum (L'Hospitalet, 2003), LEM (Barcelona, 2004, 2010, and 2015), bouesia (Deltebre, 2009), zarata fest (Bilbao, 2011, 2012, 2013 and 2015), festival audio tangente (Burgos, 2011), com a mínim (Barcelona, 2011), curtcircuit fest (Barcelona, 2012), personal-collective (Madrid, 2012). With Alfredo Costa Monteiro and Ruth Barberán, she organized the improvisers meeting bestiario (Barcelona, 2012). Performer in the world premiere of Filament, a graphical score by Ferran Fages (Huddersfield Contemporary Music Festival, 2014). Realisation of Architectural Model Making, a graphical score by Sarah Hughes (online project of another timbre, 2014). Performer: cartridge music, by John Cage, (CASM, Barcelona 2012). As a member of Ferran Fages Ensemble, programming in Pure Data and performer of radi d'or, versió per a ensemble (2011). Performer: in C, by Terry Riley (Festival Bouesia, Deltebre 2009). Member of the experimental rock band Pad (2003 to 2009). Since 2008 she is interested in creative applications of programming. Likes and uses Processing in her visual projects, a tool that also allows her to explore the use of Mathematics in creation and how artists can learn programming, as well as to approach creative work to engineers. She also use to program in Pure Data. 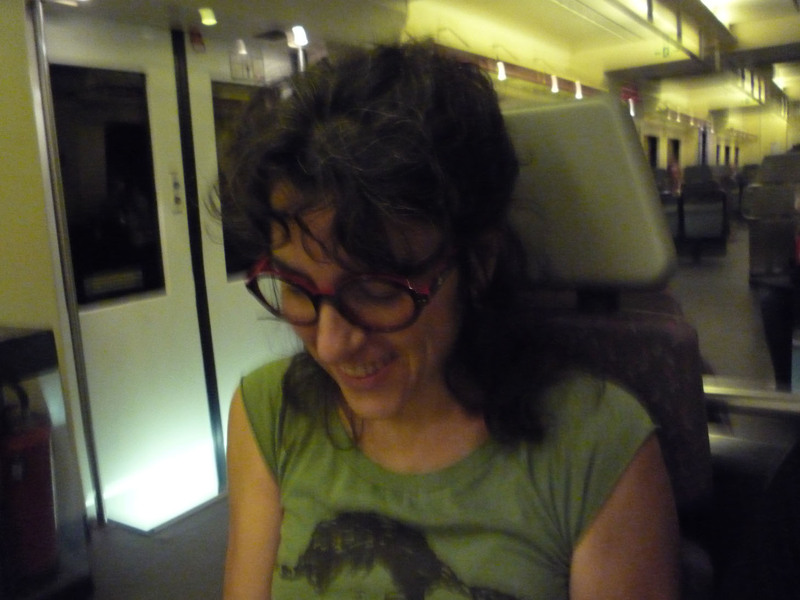 She has taught workshops and courses at lefreak (2008), circuit torçat (2011), taller tramuntana (2012), Departament de Formació de TV3 (2012), Fine Arts School of the Universitat de Barcelona (2013), Fine Arts School of the Universdad Complutense de Madrid (2014), and the course Processing: programming images, animation and interaction at the Universitat Politècnica de Catalunya (2008 i 2011). She organized the meetings ProcessingBCN (Hangar, Barcelona, 2009), with Alba G. Corral, and ProcessingInteract (Hangar, Barcelona, 2010), with Oriol Aragonès. Genera Esfera, interactive installation presented at MiRA Fest 2015. Workshop and competition for high school students at DITMAE 2015. Visuals in Processing for A=B, Pad and festival de la raya (2008 to 2011). Mathematical consulting for the windows geometry of a multitouch framework, as a collaborator of Ping Pong Technologies SL (2009). Prototyping mimodek, project by Marie Polakova for the media facade at MediaLab-Prado, in Processing (2010). Programming in Pure Data for the projects Octofònic per a granotes i sinusoïdals (2010) and Ferran Fages Ensemble (2011).